FLANAGAN (Carrickmore) November 6, 2018 Seamus (James) R.I.P. Peacefully at home. Beloved husband of Alo, loving father of Clare, Brian, Sean, Brendan, James and Eamon, brother of Desmond. Predeceased by his first wife Peg. Remains leaving his late residence, 4 Hazel Hill Road on Friday at 10.15am for 11.00am Requiem Mass in St Colmcille's Church, burial afterwards in adjoining cemetery. Deeply regretted by his sorrowing wife, sons, daughter, brother, sister-in -law, grandchildren, nephews, nieces and extended family circle. 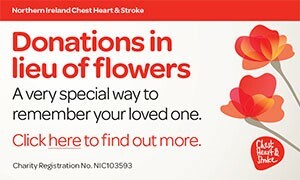 Family flowers only, donations in lieu if desired to Marie Curie. I am sorry to tell you that Seamus (James) FLANAGAN has passed away.